U n i v e r s i t y L i b r a r i e s ' N e w s l e t t e r Volume 9, Issue 2 S p r i n g 2 0 1 4 What does an original copy of Princess Beatrice's "Alice in Wonderland," a speaking picture book and a bird's-eye city map from the 1800s have in common? 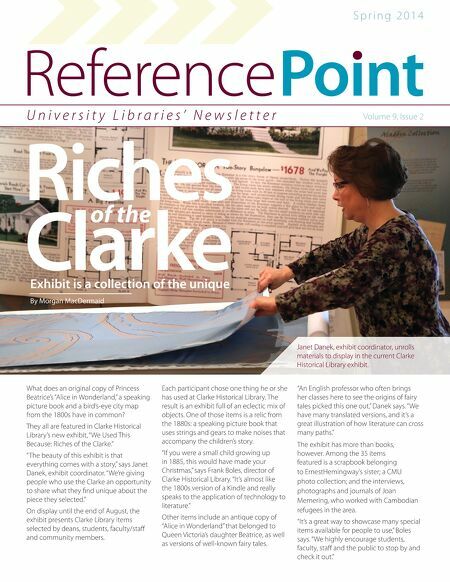 They all are featured in Clarke Historical Library's new exhibit, "We Used This Because: Riches of the Clarke." "The beauty of this exhibit is that everything comes with a story," says Janet Danek, exhibit coordinator. "We're giving people who use the Clarke an opportunity to share what they ﬁnd unique about the piece they selected." On display until the end of August, the exhibit presents Clarke Library items selected by deans, students, faculty/staﬀ and community members. Exhibit is a collection of the unique Each participant chose one thing he or she has used at Clarke Historical Library. The result is an exhibit full of an eclectic mix of objects. One of those items is a relic from the 1880s: a speaking picture book that uses strings and gears to make noises that accompany the children's story. "If you were a small child growing up in 1885, this would have made your Christmas," says Frank Boles, director of Clarke Historical Library. "It's almost like the 1800s version of a Kindle and really speaks to the application of technology to literature." Other items include an antique copy of "Alice in Wonderland" that belonged to Queen Victoria's daughter Beatrice, as well as versions of well-known fairy tales. "An English professor who often brings her classes here to see the origins of fairy tales picked this one out," Danek says. "We have many translated versions, and it's a great illustration of how literature can cross many paths." The exhibit has more than books, however. Among the 35 items featured is a scrapbook belonging to ErnestHemingway's sister; a CMU photo collection; and the interviews, photographs and journals of Joan Memering, who worked with Cambodian refugees in the area. "It's a great way to showcase many special items available for people to use," Boles says. "We highly encourage students, faculty, staﬀ and the public to stop by and check it out." By Morgan MacDermaid Janet Danek, exhibit coordinator, unrolls materials to display in the current Clarke Historical Library exhibit.